The architecture gets you one step ahead... The architecture has helped us build out projects here and I believe we have gotten far more than our money's worth out of it. The architecture defines the value and degree of integration that is possible among stakeholders involved in planning and operations. 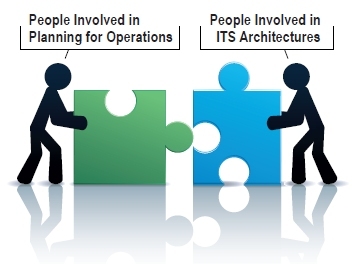 The ITS architecture, along with the ITS Strategic Plan, has assisted in defining projects and the connections between various projects and stakeholders. Transportation professionals find themselves under ever-increasing pressure to do more with less in the face of shrinking budgets, increasing demand for transportation services, and mounting customer expectations from coast to coast. At the same time, ongoing rapid advances in technology create new opportunities to operate the transportation system in a safer and more efficient manner. While technology represents tremendous opportunity for enhancing management and operation of the transportation system, it also entails challenges, particularly from a planning perspective. Planning efficient, collaborative operations strategies enabled by technology requires the use of a regional intelligent transportation system (ITS) architecture to provide the greatest level of customer service with cost-effective and regionally integrated solutions. A regional ITS architecture is a framework for institutional agreement and technical integration in a particular region. The architecture defines the links between the pieces of the system and the information that is exchanged on each connection. Over 300 regional ITS architectures have been developed so chances are good that you already have one in your region. A region is considered to be any multi-jurisdictional area defined by the needs of the collaborating agencies. Planning for operations seeks to integrate management and operations (M&O) into the metropolitan and statewide transportation planning processes. It focuses on accomplishing consensus-based regional outcomes for the performance of the regional transportation system through the use of M&O rather than developing individual projects. Operations activities are moving from stand-alone, local projects to regional solutions that require collaboration and integration. Since many M&O strategies rely on technology, the regional ITS architecture is an essential tool in supporting the integration of M&O strategies across a region to accomplish these regional outcomes. The architecture puts each of the strategies in a regional context, resulting in more cost-effective solutions and ultimately more seamless service across jurisdictional boundaries. It defines how a region can most effectively integrate new strategies that include ITS with other existing or planned technology deployments to provide a greater level of service for the customer. Planning for technology-based operations activities is fundamentally different than planning for traditional capital infrastructure projects. No one has the foresight to accurately forecast progressive technology innovation over a 20-year timeframe in a metropolitan or statewide transportation plan, but we know that the technology innovation will occur. We also know that individual systems will become more intelligent and increasingly integrated over time. 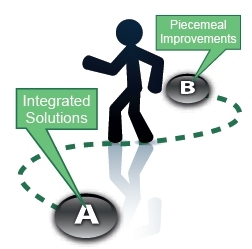 The most advanced systems that are currently being implemented – Active Transportation and Demand Management (ATDM), Integrated Corridor Management (ICM), and regional traveler information systems are all predicated upon effective integration between systems at a technical level and between organizations at an institutional level. Next generation systems will continue the progression toward increasing integration of intelligent systems, including mobile devices that will offer a better understanding of transportation operations performance and more effective communication with transportation customers. The regional ITS architecture is a tool that is specifically designed to support planning for integration among these intelligent systems, organizations, and customers. Even for smaller or less complex regions, using the regional ITS architecture to support planning for operations has substantial benefits including a reduction of duplicative efforts and increased leverage of existing and planned ITS and data resources across the region. Lesson Learned. Several issues can result from NOT using the architecture. For example, a county road commission recognized the value of the architecture only after encountering a series of challenges in coordinating signal control along a major corridor between the county, the State and several cities. More proactive participation as the regional ITS architecture was developed would have better aligned individual agency plans and greatly facilitated this process. Using the regional ITS architecture results in a collaborative process for fitting the pieces of the transportation system together in a more integrated and compatible way. Building on the holistic "all modes and all roads" integrated framework of the architecture provides tangible benefits for planners, operators, and the transportation system. This primer provides useful guidance for how use of the regional ITS architecture can enrich that planning for operations activity and achieve the next big step in regional compatibility. A regional ITS architecture documents the interrelationships between ITS applications within a region and provides a structure for enhancing those relationships. By applying the regional ITS architecture in planning for operations, these interrelationships can be recognized and a more efficient and effective system of operational strategies achieved. Rather than competing for funding to implement piecemeal improvements, agencies can use the architecture to collaboratively develop a more integrated set of regional solutions. The regional ITS architecture can also be used to identify the data that is available in the region to monitor transportation system performance and track progress toward operations objectives that are central to the objectives-driven, performance-based approach to planning for operations. The architecture provides an ideal framework for identifying these data sources and planning the monitoring systems that can be used to measure performance for the region's congestion management process or other data-driven transportation planning activity. Figure 3: This Primer is Intended to Bring Together Two Audiences. Although there are significant benefits, there can also be challenges in applying a regional ITS architecture in planning for operations. This primer provides useful recommendations on how those challenges can be overcome. The professionals who are responsible for transportation planning in a region are often different than those who are responsible for operations, and using the architecture in transportation planning requires ongoing collaboration between these practitioners. Although the regional ITS architecture initially brought together the planning and operations professionals to work collaboratively in many regions, that working relationship has not always been sustained. In other regions, the regional ITS architecture was developed by a consultant with a regional committee providing oversight and so the collaboration may have been limited in scope. Other challenges for applying the regional ITS architecture in planning for operations may be limited resources for additional planning efforts in a region or differences in the timing of the cycles of operations planning and ITS architecture updates. This primer provides recommendations for how these types of challenges can be overcome. I think that one of the biggest benefits for us is seeing on paper how many different people are involved. We have been able to focus on what our end goal is as traffic engineers and have a roadmap of how to get from where we are to where we want to be. It is a constant reminder that more people need to be involved in the planning process than just us. The architecture is an inventory of elements, linkages of the elements and data exchanges, and stakeholders. All of this knowledge assists with improving planning, implementation and reducing project risk. Finally, the regional ITS architecture can provide an entry point to project development and systems engineering and standards. For these implementation steps, developers of operational strategies within a region can draw on the architecture to provide initial input to these processes. While this primer is not intended as a guidance document for implementation of operational strategies, understanding the needs can help in seeing operational strategies though to successful programming, design, and integration. Referencing the regional ITS architecture can help provide that understanding. This primer includes five chapters that are organized to introduce you to the key concepts of planning for operations and regional ITS architectures and then to describe how the regional ITS architecture can be used to improve planning for operations. The primer is organized to be read front to back as each chapter builds on concepts presented in the previous chapter, but feel free to skip around and sample content, particularly if you already have some background in planning for operations and regional ITS architectures. This primer is written for two audiences: 1) Transportation planning and operations staff and consultants who are involved in planning for operations and, 2) staff and consultants that are involved in regional ITS architecture development, use, and maintenance. In many cases, there is overlap between these audiences, and indeed, our intent is to increase the overlap since planning for operations and regional ITS architecture activities should build upon one another. To support the dual audience, the primer bounces back and forth between the two perspectives. Whether you are a transportation planner, an ITS engineer, or an operations practitioner, this primer will help you to understand how a regional ITS architecture can be used to make planning for operations more effective and efficient. Chapter 2: Planning for Operations and Architecture – A Quick Tutorial – This is the place to start if you need some background in the objectives-driven, performance-based approach to planning for operations or the regional ITS architecture. The last part of this chapter explores the relationship between planning for operations and architecture, which is new material that may be helpful even for those who are well versed in both processes. Chapter 3: Opportunities for Architecture Use – This chapter looks in detail at the opportunities to use the regional ITS architecture to support planning for operations. With a decided planning for operations perspective, the chapter steps through the planning for operations approach and identifies how the regional ITS architecture can be used at each step. Chapter 4: Creating a Planning-Supportive Architecture – This chapter is written more from the regional ITS architecture perspective. Given the opportunities for architecture use explained in Chapter 3, this chapter identifies how the architecture can be improved to better support those opportunities. This chapter also covers ITS strategic plans and regional concepts for transportation operations (RCTOs) and their role in supporting planning for operations and architecture. Finally, this chapter provides guidance on the relative scheduling of transportation plan and architecture updates. Chapter 5: Your Action Plan for More Productive Architecture Use – This chapter describes the process improvement steps that will institutionalize architecture use in the transportation planning process in your region. It defines a process that builds decisionmaker support, assesses current architecture use, and plans the necessary steps to make architecture use more efficient and productive. Appendix A: Turbo Architecture – This appendix provides a quick introduction to the Turbo Architecture software that is used to create, maintain, and use regional ITS architectures with particular focus on the features in the software that support planning for operations. Appendix B: Regulatory Requirements – This appendix includes excerpts from SAFETEA-LU,Title 23 CFR 450, and Title 23 CFR 940 that are related to management and operations planning and use of ITS architectures to support planning. 23 CFR 450.208(f) levies a similar requirement on the statewide transportation planning process.